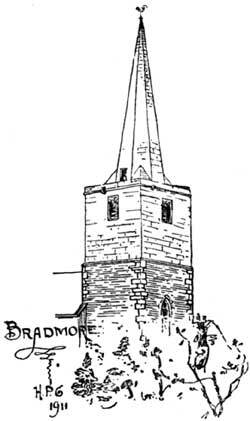 Bradmore church spire (drawing: Harry Gill, 1911). FOR the Spring Excursion of 1902, the district between Nottingham and Willoughby-on-the-Wolds was chosen ; and on May the 27th, about sixty members and their friends, favoured by charming weather, visited the various places of interest arranged for the day's outing. Among those present were the Revs. T. W. Swann, Atwell M. Y. Baylay, A. Du Boulay Hill, Messrs. G. E. Hore, H. Hill, F. Atkin, James Ward, Arthur Ward, R. A. Wilde, T. M. Blagg, R. Mellors, R. Whitbread, S. Page, W. Bradshaw, C. Gerring, M. Cuckson, W. Stevenson, B. Wilcockson, F. W. Dobson, W. Kiddier, H. W. Pine, W. B. Cooke, J. Selby and J. Granger; Mr. and Mrs. Phillimore, Dr. and Mrs. Littlewood, Mr. and Mrs. F. W. Neale and party, Mr. and Mrs. Pickerill; Miss Guilford, Miss Hore, Miss Ethel Smith, Miss E. Fellows, and Miss Ashwell; Mr. J. C. Warren, honorary treasurer ; and the Rev. J. Standish and Mr. George Fellows, joint honorary secretaries. Starting from the Midland Station at Nottingham, in four brakes, the party drove by way of Wilford and Ruddington to Bradmore and Bunny. At Bradmore, more properly spelt Bradmere, a passing notice was taken of the tower and spire, the only existing remains of a chapel-of-ease formerly served by the Vicar of Bunny. In the reign of Queen Anne (1705), a great part of the village was destroyed by fire, and a brief issued at the time puts the damage at £6000. The church, at any rate, was never rebuilt. A small brick building was added to the tower about thirty years ago, and used for occasional services; but more recently the building seems to have become a barn. The tower is built of rubble in the lower part and of ashlar in the upper, and a plain broached spire springs from a plain parapet which has remains of gurgoyles. The west window and the two-light belfry windows are of the Decorated period. At Bunny a halt was made outside the picturesque school and almshouses, erected by Sir Thomas Parkyns, the second baronet, in the year 1700. His arms appear in stone, over the doorway, with the following inscription in English below them:—"This school with four rooms for four poor widows was built A.D. 1700 by Sir T. Parkyns Bart., second son of Lady Ann Parkyns, sole daughter and heiress of Thos. Cressy Esq., and relict of Sir Thomas Parkyns Bart, deceased who endowed it with £10 per annum out of the rents, being £ 16 per annum of a certain close lying in the lordship of Thorpe-in-glebis, in the said county commonly called by the name of Nook Quarter. The sum of 403 per annum of the £16 to be bestowed on gowns and petticoats for each widow every other year and the remainder of the £16 after taxes deducted, to be bestowed as by one deed enrolled in Chancery, another in the Trustees hands, and a third in a chest in Bunny Church, among the town's writings. This school is to be free for all the children in Bunny and Bradmore, only 1s. is to be paid on the entrance and admission of every child into the Free School and 6d. quarterly whose parents pay to public levies, otherwise to pay nothing." Sir T. Parkyns by another deed entered as above, has settled £5. 43. per annum for ever, to be paid out of Thorpe lordship, at 2s. per week, to be distributed every Sunday in Bunny Church, amongst the poor widows and widowers of Bunny and Broadmore, who used to come to church whilst able. Also the rents of £200 of land lying in the lordship of Newton, Nottinghamshire, left by the younger daughter Ann Parkyns, her will, in the year 1711 for the putting forth of children apprentices to mysteries and trades, and of the town of Bunny, Bradmore and Cortlingstock, at their age of 14 years, who must first be educated in true reading, legible writing and vulgar arithmetic. The said will proved at Doctors' Commons, in London. These are pious and charitable donations. Blessed are they that considereth the poor' Psalm 44 Charity recovereth us from Sin and delivereth us from death. At the church the members and their friends were met by the Vicar, the Rev. Herbert Cooper. The ground plan of this church consists of chancel, nave of five bays with north and south aisles, south porch and western tower and spire. The chancel measuring 55 feet by 24 feet is one of remarkable size and dignity and clearly possessed at one time a grand array of stalls. It is difficult to say for whom and by whom such a chancel was built, as the church does not appear to have possessed at any time a College of priests; but the Torre M.S at York (p. 111) states that "on the 20th Sept 1344 John, Archbishop of York ordained that there be in the church of Bunny (appropriated as before to the Priory of Ulverscroft) one perpetual vicar &c and the said Convent .... shall be at the cost of new building the church, and repairing the walls thereof, when required, and bear all other burdens, ordinary and extraordinary whatever." This fine chancel contains both Decorated and Perpendicular work. At one time the south wall was pierced with four pointed windows, and the north wall with two pointed windows to the west and two square-headed ones to the east. In the south wall the windows, east and west, have been walled up, and in the north wall the two Perpendicular windows have been dealt with in the same inconsiderate way. The east window is square-headed without tracery, and of five lights with upper and lower stages. Externally the chancel is supported north and south by five rectangular and pinnacled buttresses, and there are two others at the east end. The embattled parapet on the south is of modern construction. The nave and aisles are of the early Perpendicular Period and are separated to the north and south by an arcade of five bays. The arches are of two orders of chamfers and have a hoodmould on the north side, and are without it on the south. Counting from east to west the first three pillars both north and south are circular, and the fourth is octagonal. The responds to the north are semi-octagonal and to the south semi-circular. Caps and bases are octagonal, the cap nearest the chancel on the south side being carved. In the clerestory there are four square windows of two lights each, headed with ogival arches. The roof is an old flat Perpendicular one ; and the parapet is embattled, pinnacled, and panelled with quartrefoil ornament. A good oak screen divides nave from the chancel. Traces of mural painting are to be found within the chancel on the south side of the chancel arch, and also on the east wall of the nave, on its north side. The first seems to be a representation of the Virgin and Child; the second is more difficult to decipher. There is also a piscina, in the side chapel now used as a vestry. The windows of the aisles are of the same Decorated type as those in the chancel, and there is also a west window in the north aisle, which has the Depressed Tudor arch. The archway into the tower is very fine and lofty. It has two orders of chamfers, and corbels terminate the inner order. Externally the nave is supported by diagonal and rectangular buttresses. The south porch is work of the Perpendicular period. Below the apex of the gable is a small niche, no doubt intended to contain the figure of the patron saint, and above the apex rises a beautiful pinnacle. The porch has a vaulted stone roof, and on either side a pointed, open traceried window of three lights, unglazed and with iron stanchions. There are two rectangular buttresses on either side, and these are pinnacled; there is also a panelled parapet like that of the nave, with quatrefoil panels. The tower and spire are of the Decorated period. A pair of rectangular buttresses supports the tower at the angles and the staircase is built into the south-west one. The upper part of the tower has on each side pointed windows containing tracery; and pinnacles with crockets surmount the corners of a once embattled parapet. The spire is octagonal and is daintily fringed with crockets, many of which have disappeared. One or two details are worthy of notice. On a buttress of the south wall there is to be found carved, one of the supposed sundials with its many lines radiating from a central hole which would hold the gnomon. In the tower an old slate sundial, without its gnomon has been preserved. It is dated 1791. A very old bier also exists, and appears to be still in use. Going as far back as the days of Queen Elizabeth, we find the manor of Bunny (or Boney as it was previously spelt) possessed at that time by the family of Barley or Barlow. One Humphrey Barley, lord of the manor, married Elizabeth Beresford, of Fenny Bentley, in the county of Derby. He died on the 10 July, 1570, and a mural tablet, shewing his arms with many quarterings, and erected by his widow, is still to be seen at the east end of the north aisle of the church, though he himself was buried at Stony Middleton, in Derbyshire. His widow married Richard Parkyns, a Justice of the Peace and Custos Rotulorum in the county of Notts., Recorder of Leicester and Nottingham, and an Utter Barrister of the Inner Temple. It was through this marriage that Bunny became identified with the family of Parkyns.2 There were eight children by this marriage, viz., four sons and four daughters, of whom Sir George Parkyns, Knight, was the eldest. Richard Parkyns died on the 3rd July, 1603, and was buried, as he directed, in the chancel of the church ; and his wife, dying five years later, desired to be buried near her second husband. Their mural tablet is to be seen in the chancel and her tomb there, near her husband's, testifies to the carrying out of her wish. Isham Parkyns, their grandson, was so staunch a supporter of the Royalist cause that on the 18 May, 1681, he was created a Baronet. 1. Transcriptions and translations courtesy of John Boutwood (December 2010). 2. She had one of the Manors of Bunny in lieu of her right of dower, the reversion of which Manor her husband afterwards bought, with the other two Manors of Bunny and Broadmore.